The American College of Radiology (ACR) announced the launch of a free software platform, AI-LAB, designed to encourage radiologists to participate in the creation, validation and use of artificial intelligence (AI). The software, developed by the ACR’s Data Science Institute, gives radiologists a set of tools to develop AI algorithms at their own facilities, using their own data, engineered behind their own institutional firewalls. The open, vendor-neutral framework will also give radiologists the ability to learn about AI, contribute datasets, share algorithms, develop and evaluate models. The use of AI technology in the healthcare and medical industries has spurred numerous new development initiatives, including the Center for Clinical Artificial Intelligence, created by Cleveland Clinic Enterprise Analytics and dedicated to new advances and applications for AI and machine learning. In partnership with Hasso Plattner Institute, the New York health system Mount Sinai will devote new resources to advancing biomedical and digital engineering, AI, machine learning and more. 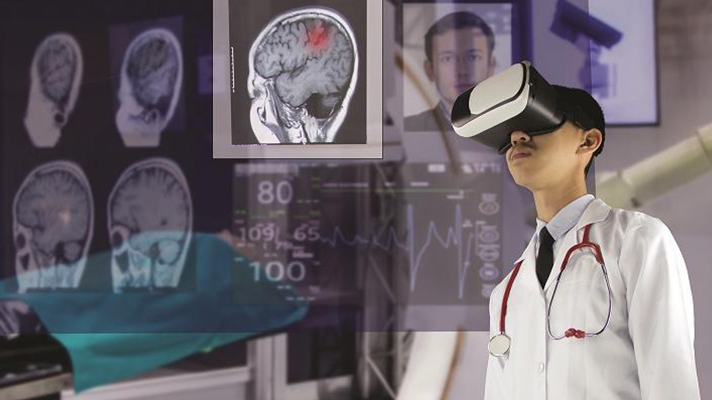 In addition to AI, interactive virtual reality (VR) could also help improve the efficiency of interventional radiology treatments, as well as increasing portability and patient access, according to a March study by the University of Washington Medical Center. The VR software, which provides a dynamic holographic display of vascular anatomy using real-time 3D images from inside a patient’s blood vessels, was developed through a University of Washington business incubator that supported development of a startup, Pyrus Medical. “Acquiring the necessary large amounts of patient data for algorithm training has been a huge problem for developers up to this point,” Keith Dreyer, the Institute’s chief science officer, said in a statement. “Consequently, AI has been slow to develop and has not spread widely to improve patient care. Dreyer noted that enabling radiologists to develop AI on-premises, at their own institutions, could unlock massively larger data stores available for the development of AI, leading to a rapid expansion of AI-based solutions available to everyone. The ACR’s platform will also support future FDA initiatives involving the use of real world data for local adaptive learning for algorithm improvement, as well as the monitoring of continuously learning algorithms.